C. D. ROSE was born in the north of England and studied in several of that country’s elite universities, including the University of East Anglia, where he went to do an M.A. in creative writing, and Edge Hill University, where he is at work on a Ph.D. His research into great lost literary works drew him on to live and work in several different countries, including Italy, France, Russia and the United States, where he enjoyed a number of encounters with curious authorial personalities. His research interests have not abated, and now, though based in England, he continues to travel in an unending quest for that one elusive, perfect tale. “Nuanced... Though the vignettes are fictional, most are entertaining and all could serve as warnings to anyone thinking of taking up the literary life." “An anthology that cleverly calls out the ways in which we dramatize—and idolize—the lives of authors, successful and not." “This selection may appear to break the rules, but this hilarious 'dictionary' of literary may not be as non-fictional as you think. It helped inspire my new favorite life-negating maxim: fail worse and go out on bottom." “Humorous, high-toned and absurd... It's a fun book." “Spend an hour with it...for a bracing, mordant reminder of why almost nothing is really worth bothering with." “A mesmerizing and hilarious little book." “This gloriously delicious testament to efforts of the wordy kind that seem to have gone off the rails offers the literary shenanigans of some rather suspect authors." “[A] delightful compendium... The BDLF is a clever put-on, a brisk stroll...guided by Rose’s fastidious prose and copious literary references, but it is also a clarion for the infinite possibilities of literature." 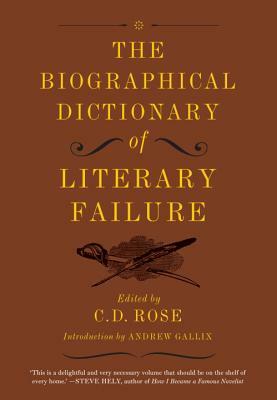 “More a short story collection than a dictionary, this book is an homage to the many ways writers can fail... Failure. Of the most spectacular kind." “Offers us a shadow history of literature... Whether the subject is Icarus-like or more of a Walter Mitty, Rose’s writing is unfailingly sympathetic and inventive." “Taking long-form comedy to brave new heights… Rose well utilizes that trick good writers have of including readers and making them feel smart." "A page turner of the best sort of slow motion, train wreck sort of way... Give this petite compendium a read!" "A wonderful book. At long last someone has invented these failures and given them their due. We owe C. D. Rose an incalculable debt." "A funny look at literary legends who, for one reason or another, managed to fall into oblivion (or fail to get noticed in the first place). From authors leaving masterpieces on trains, to those who compulsively--and literally--eat their words, this book will get you thinking about losses to literature that we'll never get to hear about. Just don't eat this book, please. Or, if you must, buy another copy afterwards... and restrain yourself from eating that one, too."